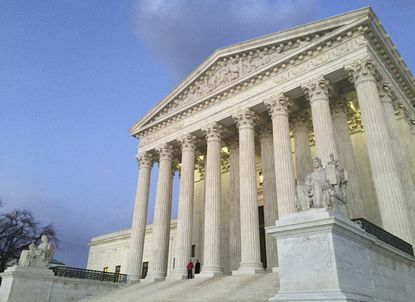 A divided Supreme Court said Thursday that Louisiana may not enforce a law that opponents say would close most of the state's abortion clinics and leave it with only one doctor eligible to perform the procedure. The justices may yet consider whether the 2014 law - requiring doctors at abortion clinics to have admitting privileges at nearby hospitals - unduly burdens a woman's access to abortion. The Louisiana law has never been enforced, and the Supreme Court in 2016 found a nearly identical Texas law to be unconstitutional. Chief Justice John Roberts Jr. joined the court's four liberals in blocking the law for now. The majority did not give a reason for granting the stay, as is the court's custom. The court's most conservative members said they would have allowed Louisiana to begin the process of enforcing the law. In the court's 2016 decision, it said the admitting privileges requirement "provides few, if any, health benefits for women, poses a substantial obstacle to women seeking abortions, and constitutes an 'undue burden' on their constitutional right to do so." But last fall, a panel of the U.S. Court of Appeals for the 5th Circuit upheld the Louisiana law in a 2-to-1 vote, finding factual distinctions between how the restriction played out in Texas and Louisiana. The full court, considered one of the most conservative of the regional appeals courts, voted not to reconsider the panel's decision. Dissenting judges said their colleagues in the majority ignored requirements set out in the Supreme Court's 2016 decision and seemed intent on giving the high court reason to reconsider that precedent, called Whole Woman's Health v. Hellerstedt. The Whole Woman's Health decision was the court's most important one on abortion in a quarter-century. But it was decided by a very different eight-member Supreme Court in the wake of conservative Justice Antonin Scalia's death. Justice Anthony Kennedy joined the court's liberals to strike down the Texas provisions. Roberts and Justices Clarence Thomas and Samuel Alito Jr. dissented. But those three have since been joined by President Donald Trump's choices, Justices Neil Gorsuch and Brett Kavanaugh, both of whom were supported by antiabortion activists who said they hoped that the court's new conservative majority might one day overturn the fundamental right to abortion the court advanced in Roe v. Wade. At stake "is not just the constitutional rights of Louisiana women to abortion access," wrote Julie Rikelman and Travis Tu of the Center for Reproductive Rights, which challenged the law. "The Fifth Circuit panel majority's decision undermines the rule of law by flouting binding precedent from this Court. Such a ruling has implications for the country and the judicial system as a whole." Judge Jerry Smith, writing for the two-member appeals court majority, said that the court complied with the Supreme Court's decision in Whole Woman's Health by taking a painstakingly close look at the details. "Unlike in Texas, the [Louisiana law] does not impose a substantial burden on a large fraction of women," he concluded. He said the closing of some clinics in Louisiana, as opposed to Texas, would not dramatically increase driving distances, and that it was easier for doctors in Louisiana to obtainadmitting privileges. The "vast majority" of the six doctors who performed abortions in Louisiana "largely sat on their hands" instead of working hard to procure the credential, Smith wrote. He concluded that "at most, only 30 percent of women" seeking abortions in Louisiana would be affected. "The record here indicates that the admitting-privileges requirement performs a real, and previously unaddressed, credentialing function that promotes the well-being of women seeking abortion," Smith wrote. Still, he acknowledged, the benefits are "not huge." In a footnote, Smith wrote that "the state did not provide any instance in which a worse result occurred because the patient's abortion doctor did not possess admitting privileges." Dissenting judges and the challengers said it was a fundamental mistake to approve a law that imposes any burden on a woman's right to an abortion when it provides no corresponding benefit for the woman's health. The appeals court rejected a district judge's finding that the law would affect about 70 percent of women seeking abortions in the state. After a trial, that judge found that two of the remaining three abortion clinics in the state would have to close because they would not have a doctor who could obtain admitting privileges. The only remaining clinic with an eligible doctor would be in New Orleans, and incapable of meeting the demand of approximately 10,000 abortions. In its brief to the court, Louisiana denied that allowing the law to go into effect would throw the system into "chaos." It intends to give the clinics 45 days to submit documentation that they are complying with the law, Attorney General Jeff Landry said in a brief. But the challengers said the penalties would start immediately, and no law-abiding clinic would provide abortions if it did not have an eligible doctor. They said the "brunt" of the law already was being felt. "Scheduled medical procedures are being cancelled, physicians and clinic staff are preparing to be out of work, and patients seeking to exercise their constitutional right to abortion are being turned away or sent to other states," their brief states.